Want to step-up your #shelfie game? Bookends are the easiest way to add some serious style and glamour to your space, but who wants to pay a small fortune just to get your hands on a pair? Thankfully, we’ve rounded-up 40 of the most amazing bookends that you can create yourself in no time! From upcycled toys and glittering crystals to designs made from cement, wood, plastic and more – you’re sure to find a few DIY varieties which will make your heart sing. Are you ready? Let’s get started below! Bookends are great, but how do you create invisible bookends, we hear you ask? Thankfully, the girls at A Beautiful Mess will show you how – no magic required! If retro bookends are more your thing, then you’ll adore these old phone inspired versions from A Beautiful Mess. How unique! Who knew that some gold cylinders could look this great? They serve as the perfect bookends, so be sure to check out the DIY tutorial from A Beautiful Mess! Blitsy will teach you how to create this DIY cement hexagon bookend to add some much-needed modernity and style to your bookshelf. Time for a #shelfie! Trust the team at Brit + Co to come up with this wonderful color-blocked bookend design! We love the color combination. Think these gold bookends are from an expensive store, such as West Elm or Anthropologie? Think again! Build Basic will actually show you how to make these yourself…and on a budget! If you’ve got a stack of bricks lying around doing nothing, why not turn them into pretty bookends, just as Camille Styles has done? This is upcycling at its best! Grown out of your old toys? If you don’t want to part from them, then we suggest taking a leaf out of Canadian Family’s book and turning them into cool bookends! How gorgeous are these gold-plated agate bookends? You too can make these yourself simply by following this tutorial from Chic Steals! We think these DIY gold bunny bookends are so adorable, don’t you? Crafted Sophistication is the talented blogger behind this creative project! These gorgeous DIY amethyst bookends from Curbly have got our hearts in a flutter! Who wouldn’t want to make these glamorous and crafty creations? Get some gold-painted pineapples on your shelf by making these DIY bookends from DIY Candy. They’ll infuse your room with that tropical vibe! These DIY cement letter bookends look fab! You can create your initials or use ‘A’ and ‘Z’ as DIY Candy has done. Skull bookends – how Shakespearean! Divide As By You spray-painted theirs in gold and they look incredibly on-trend. These DIY arrow bookends from Domestically Speaking don’t just keep your books upright – they also look brilliant too! Check out the full tutorial for materials and method. Children and adults alike will love these DIY dinosaur bookends from Doodle Craft! They’re cute, crafty, and very colorful. Did you know that making your own vinyl bookends are as easy as melting them in hot water then molding them? Groupon certainly did, so created this cool DIY project! If you’re looking to add some coastal chic to your home, look no further than these DIY coral bookends from Home Made by Carmona! If you’re a fan of baseball (or know someone who is), then these DIY baseball bookends from Home Talk are perfect for you to create! They’ll be a true centerpiece to admire. This crafty tutorial via Hot DIY Tutorial will show you how to make your very own felt rhino bookend. He’s cute, cuddly, and will certainly keep your books standing straight! 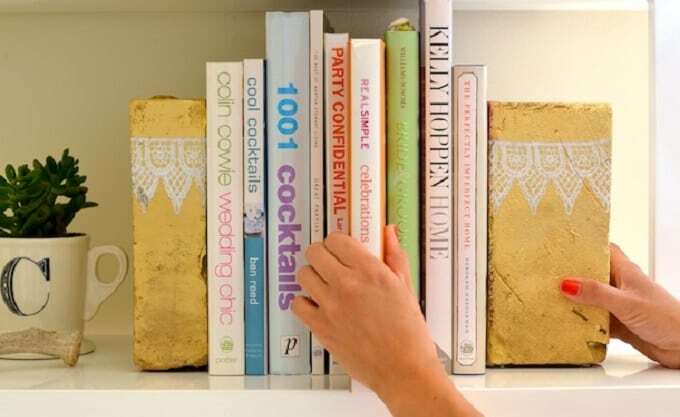 Here’s a DIY bookend that’s super practical too! I Spy DIY has created these to house all sorts of things, such as plants, pens, whatever your heart desires. Add some sentimentality to your bookends by following this DIY tutorial from Landee See Landee Do. She’s included framed photos of loved ones in the design – brilliant! These DIY superhero silhouette bookends from Little Red Window are an absolutely genius idea, don’t you think? Which superheroes will you choose to create? Lovely Indeed has turned a polar bear into two glorious DIY bookends which are worthy of a high-end boutique! Find out more by viewing the full tutorial. These DIY wood triangle bookends from Make and Tell are super stylish yet so easy to create! Even beginner crafters will want to make these. Mod Podge Rocks has given a basic wooden bicycle bookend kit a mod podge makeover using paper and material in pretty patterns. She’ll teach you all you need to know in her tutorial! You can also decorate some otherwise plain letters with beautiful patterns before turning them into DIY bookends, just as One Good Thing by Jillee has done. Hooray! Are you or your partner a Star Trek fan? This DIY bookend from Our Nerd Home would be the perfect gift to surprise them with if they are! These DIY elephant and stone bookends from Pop Sugar Moms are so clever! You can paint them in any color that your heart desires too. Surprise your loved ones with these cheerful and colorful letter bookends from Pretty Handy Girl. You’ll have so much fun making these! What a clever and budget-friendly way to create some adorable bookends! Pretty Providence has reused those gorgeous bear honey bottles. Refinery 29 will show you how to create two awesome bookend designs using rocks. This one features a pink and gold ombre inspired effect! This one from Refinery 29 would have to be our favorite! Who knew that a simple rock would look so cool with a gold triangle painted on it? 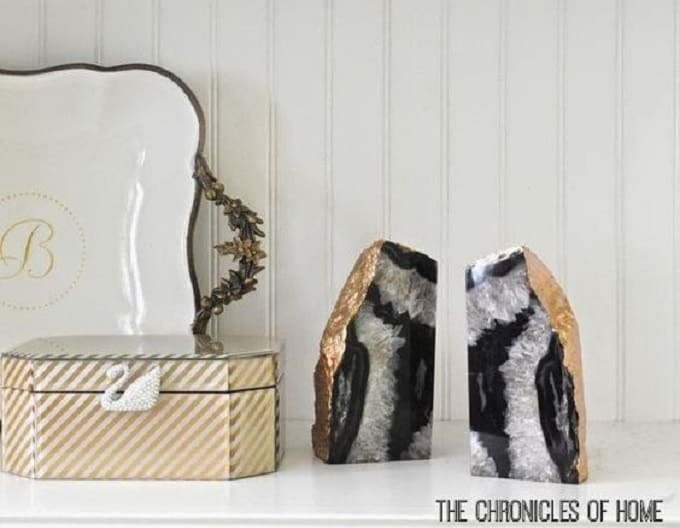 Agate is all the rage now, so why not turn some into a pair of very stylish bookends for your shelf? Sawdust 2 Stitches will guide you through the process! These DIY rainbow bookends are just what your child’s bedroom needs! That’s My Letter was certainly onto a good idea when she created these. Wow, here’s some very fancy agate bookends indeed! You’ll still be saving money compared to buying your own, so be sure to check out this DIY tutorial from The Chronicles of Home. Simply turn two of your favorite animal figurines into gold bookends – the Kitchy Kitchen way! This DIY project is so versatile. It’s time to get a little bit geometric with these DIY orb bookends from The View from Here! What a brilliant idea from the blogger. When it came to making cool DIY bookends, Twelve O Eight opted for a horse of course! This is a great idea to upcycle old toys. Rhinos and spray-painted bricks – sounds intriguing! We love this DIY bookend idea from Whoa Bella. They’re sturdy and stylish! 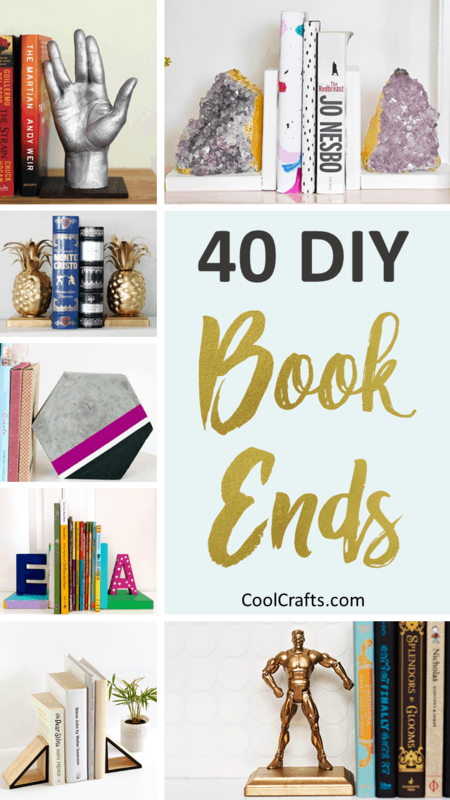 There you have it – 40 DIY bookends that are sure to make your books stand to attention! Which projects were your favorites? We’d love to hear from you in the comments section below. I love this and I want to make them too, what a wonderful gift with lots of love your create when you make them.